[Translate] Of all my snacking and meals I have had in London, The Clove Club is definitely one of my favorite meals that really stuck with me even months after eating there. The food is very different and exciting compared to the U.S. or New York City are having these days (see Adam Platt of New York Magazine’s interview.). The Clove Club is sort of out of the way for those who are residing on the west part of London but certainly worth the trek. When you enter the light blue doors of The Clove Club, the first thing you..
[Translate] Harrod’s Exterior One thing London is really great for (besides it’s burgeoning food scene) is their luxury shopping. It’s no secret that London has been doing the high-end shopping for centuries. Literally. A brief history about the legendary store: Harrod’s was founded by Charles Henry Harrod, first established his business in 1824, as a draper, at 228 Borough High Street in Southwark, London. By 1834 Harrod founds a wholesale grocery in Stepney, East London and by 1849, Harrods moveds to the current address in Knightsbridge area. In May 2010, the store was sold to Qatar Holdings, the sovereign wealth..
[Translate] Exterior of Smokehouse; Interior and towards the kitchen Smokehouse located in the east side of London of Islington, is owned by Chef Neil Rankin that opened August 2013. I dined with the lovely, fellow Londoner Cassie as she suggested this place after informing her my crazy itinerary of eating. This gastropub is not the typical pub one would think of. It’s casual but prettily done and not overtly masculine. Candles indoors and fairy lights in the pretty garden, a few small antlers, blackboards boasting of many craft beers, and food menu. When you peruse the food menu, it’s eclectic..
[Translate] Interior & Views of SE London at Duck & Waffle When I was in London in April, I had lunch with the vivacious and fellow Londoner, travel blogger and friend, Federica of The Daily Out at Duck & Waffle. What drew us to this particular restaurant was the stunning views of southeast London from high up on the Heron Tower, where this restaurant is located. The fare served here is upscale comfort food (it’s prevalent in New York City as well as in London) except the Executive Chef Daniel Doherty has interesting touches on the menu that I have..
[Translate] While I was in London, I had dinner at one of the hottest restaurants in town, Chiltern Firehouse under the helm of Executive Chef Nuno Mendes. This hotel and restaurant is owned and operated by André Balazs, the famous hotelier behind luxurious, global properties that are chic and places where everyone wants to be seen like the Chateau Marmont in Hollywood. This grand, Victorian firehouse with large doors and high ceilings, lit by filament lightbulbs, brick tiles on the walls, wooden floors that spill over to tiled flooring and green velvet benches giving a very modern feel with traditional..
[Translate] I had breakfast with the popular travel blogger, Julie of A Lady in London, at Plum + Spilt Milk. 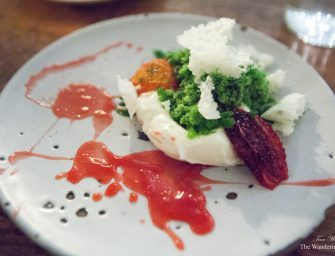 This restaurant is located in the upscale boutique Great Northern Hotel in King’s Cross, overseen by Chef Mark Sargeant. This hotel restaurant is swanky with its dark navy blue walls, dark wood, and curving cream colored leather booth seats mixed with striking pendant light fixtures. The restaurant’s name comes from a nickname given to the original LNWR dining car, painted in the railway’s traditional livery colors. I arrived a bit earlier than Julie, I took some time to catch up..
[Translate] While I was in London, I was fortunate to have a reservation afternoon tea at the historical and legendary Palm Court at The Ritz (£47.00 per person or $78.96 at the exchange rate of £1 = $1.68 US). The local Londoners would pretty much tell you if you want a traditional afternoon tea, you should go to here. The Palm Court at The Ritz is absolutely stunning. It is a destination for glamorous guests from high society to “see and be seen” dating back to 1906. The Palm Court is a dramatic room with high ceilings and its walls..
[Translate] Nordic Bakery’s Soho location interiors; Cinnamon buns; Spinach & ricotta quiche; Karelian pies Nordic Bakery was one of my favorite bakeries during my stay in London. I had received their cookbook a few years ago and was intrigued about their unique food and recipes that it stayed in the back burner of my mind to visit to this bakery one day (which finally happened). My first visit to Nordic Bakery was at their Soho location when I was shopping for food souvenirs for friends and family nearby at the legendary Fortnum & Mason. I liked the bright natural light..